In this lesson you will learn how to use the Major Modes to create 2 & 3 part harmonies. This is the easiest method that I have found to perform almost effortless harmony. You will need to KNOW the following in order to complete this lesson.. Since you are able to to view the modes on the scale generator or the other lessons on this site I will not be showing any visuals for this portion of the lesson but it is required to KNOW the order the Modes occur. 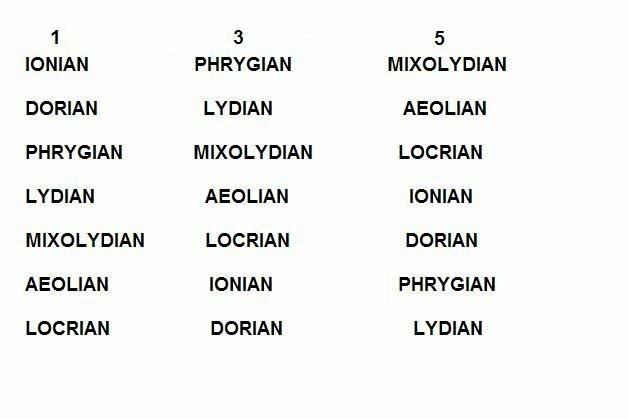 IONIAN..DORIAN..PHRYGIAN..LYDIAN..MIXOLYDIAN..AEOLIAN..LOCRIAN. After getting familiar with the order move on to the next segment. For the entire lesson we will use the 3 notes per string method of playing scales. The following charts are in A. The DOTTED NOTES ARE THE ROOT OF EACH SCALE. Notice in every visual shown above THE ROOT REMAINS THE SAME. All other notes change to play the Mode. The charts are in A to allow you to hear the difference in tone each Mode holds. And that is how to follow a sequence. Once you get an understanding of sequencing it's time for the fun to begin! Time to harmonize. Actually this is a very simple method to make you sound like Maiden, A7X or any other duo on the six string. This lesson will teach you how to harmonize the 1st(root),3rd and 5th of any of the 7 Modes. You should have the order of the Modes memorized so let's start with Ionian. For these examples we will only be using 9 notes to simplify the lesson. To create a harmony using the 3rd of the scale just skip a Mode. A Ionian would skip B Dorian and play C# Phrygian. And for all the southern rockers..3 part harmony. Use the same method..Use A Ionian, skip B Dorian, use C# Phrygian,skip D Lydian, use E MIXOLYDIAN. You can also play these harmonies starting on the third or fifth lower than the root. Tapping and hammer on harmony can be used. Just tap each string using the same sequence pattern for each mode. This example's sequence is..3.1.2.1(4x)per string using the Ionian and Phrygian modes. I realize that this method may not be for everyone but I find it works best because I don't have to think about playing the third in the correct Major or minor, which can get complicated when you play different modes. It was hard enough to remember the modes so why go through the same process to figure out the third and fifth harmonies. You already know the modes play the third and fifth mode to create perfect harmony. As you use different Modes for your root you need to use every other Mode for harmony. This chart gives you those..
Now when you and another guitarist plan harmonies you don't have to pick out every note, just use the Modes and create an interesting sequence pattern(STUDY VARIOUS SEQUENCES). This is just the tip of the iceberg but it was just the tip that sank the Titanic so take this tip and create some damage. You can use this method to create harmony using these scales also.. This does not work on Pentatonic Scales but try it anyway, you get some interesting stuff. The last example uses a Whole Half ascending with a Diminished descending. That is pretty good man. I never really looked at it that way. Honestly, I think you are about to confuse the hell out of some people hehe. But great lesson! This is a great thing man! I agree with gs, i have never looked at it that way. But cant you also create a harmony by just playing a third up WITHIN a scale? My old guitar teacher taught it to me this way and it worked out quite well until now. I put a lesson up on harmonies where i quickly described it. Yea, Admiral you can do that. That is the same as what Moshzilla described, the only difference is, he explained it as an entire scale being relative to the next entire scale. If you just move up a third in the scale, you will have the same outcome, just one note at a time as opposed to the entire scale. Make sense? Glad you guys like it. I kinda stumbled onto this by accident but when I studied it out it became simple. Will i play all mode in lets say i play E major can i play all mode in E note or what..??? How to function dim n aug in licks or riff...where we use this scales n pattern,will u pls explain me ??? @Gopal.david This lesson was created to show how the modes can be harmonized. For a good explanation of modes check out these lessons on modes right here on this site.